Those two motives are not mutually exclusive. I’m constantly on the look-out for spirit-inspired wares. Although I describe some of them in the Encyclopedia of Spirits, I wasn’t able to share images, but, as this blog allows me to do so, I’ll be featuring and discussing some of these products here. 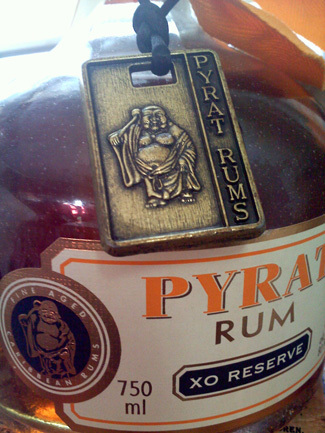 For example, this Pyrat Rum gift box, discovered in a New Jersey Whole Foods in December 2011. 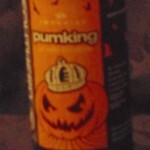 Typically, spirit-inspired advertising merely references a name or an image, without any additional information. No attempt is made to educate the non-initiate. It’s up to you to recognize the image or name. Pyrat Rum is an exception. Its packaging explicitly invokes and incorporates the East Asian spirit, Hoti. • An image of Hoti is featured on the bottle’s label. 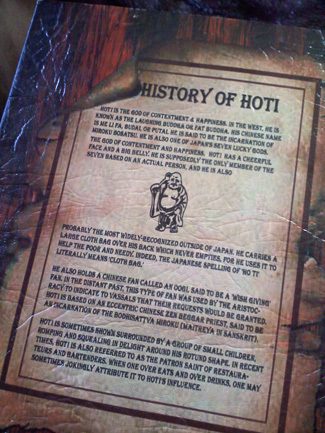 In addition to that standard packaging, this particular gift set includes a box crafted to resemble a book, with a detailed and accurate “history of Hoti” on the back. By no means can Hoti (or Hotei, as his name is more usually spelled in English) be considered obscure. 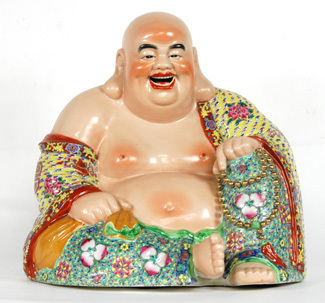 Some may know him better as “the laughing Buddha.” Hoti is counted among Japan’s beloved Seven Lucky Spirits (the Shichi Fukujin) and is the benevolent provider of luck, good fortune, fertility, and wealth. The description of Hoti as a “patron saint” is valid. As the only member of the Shichi Fukujin to be identified as a historical person, he meets all the criteria of true sainthood: he once lived and now performs miracles. 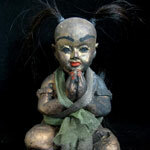 In addition to his patronage of bartenders and fortune-tellers, Hoti protects children. Like Santa Claus, who is also envisioned as a jolly, fat man, Hoti’s attribute is a big sack filled with treasure that he eagerly and generously distributes. In addition to his girth, Hoti is usually portrayed with extremely long earlobes—an indication of his wealth (his precious earrings are so heavy that they’ve stretched the lobes), but also a sign that Hoti listens carefully to the appeals of his devotees. His ears are so large, all the better to hear you with. • More information about Hotei, the Seven Lucky Spirits, and the Laughing Buddha may be found in the Encyclopedia of Spirits. • Information about what it really takes to be a saint is found in the Encyclopedia of Mystics, Saints, and Sages.